​On 12th May, a group of 20 parishioners joined the Diocesan Pilgrimage to Our Lady of Walsingham. This year's pilgrimage intention was for an increased devotion to Our Lord in the Most Blessed Sacrament, very fitting for this year in which the Adoremus Eucharistic Congress is due to take place.The weather was very kind as we embarked on the Rosary procession along the Holy Mile to the Slipper Chapel. We then enjoyed some time to visit the ancient shrine and place our petitions at the feet of the statue of Our Lady. Adoration followed in the main church, then a beautiful celebration of Holy Mass, presided over by Bishop McGough. The liturgy was splendid, with Missa de Angelis and some beautiful hymns to Our Lady, thanks to the work of the new Diocesan organiser Fr. Christopher Miller.We have prayed for our parish and look forward to the fruits of our pilgrimage in the days and weeks ahead as we prepare for the great feasts of Pentecost and Corpus Christi. Ad Jesum per Mariam! On Saturday 25th March, a group of our Servers’ travelled to St Chad’s Cathedral, Birmingham for the St Stephen’s Guild Mass of Thanksgiving celebrated by Bishop Kenney.They were given the honour of serving the Mass for the Bishop and received very good commendations for the way in which they conducted themselves on the Sanctuary and in the Sacristy.Fr Eddie Clare and Fr Craig Szmidt were also very happy to see them again. Well done to them for representing the parish so well! 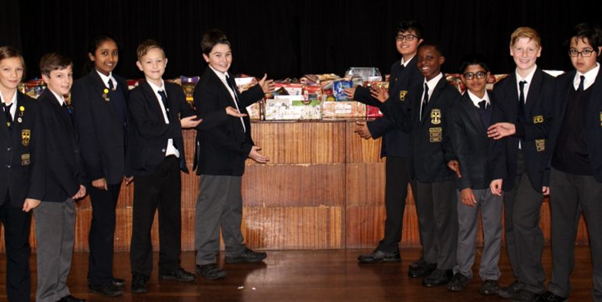 Children at A a Redditch Middle School have rallied round to collect 26 Christmas Hampers for the local community. Youngsters at St. Bede's have been busy collecting and packing boxes of festive treats, and while their target was to do 20 hampers, the generosity was in abundance and 26 have now been completed. Everything from tea, biscuits and chocolate to Christmas Crackers, mince pies and porridge has been contributed and the school principal, Mr. Lloyd Roberts said "We are all so proud of the generosity of our pupils and their families. We are now able, in conjunction with Our Lady of Mount Carmel Church, to support those in need at Christmas time." Staff at St. Bede's will be using their minibuses to deliver the hampers during the last week of the Autumn term to recipients chosen in conjunction with Mount Carmel Church, aided by pupils. Bishop Robert Byrne celebrated the Sacrament of Confirmation in the Parishes of Our Lady of Mount Carmel and Saint Peter's in Bromsgrove. Like Baptism and the Eucharist, Confirmation is one of the Sacraments of Initiation. It forms part of the response in faith to the personal call of Christ leading to a greater participation in the life of Christ's Church. Part of the response is choosing a Saint's name and the children choose some beautiful names like Abraham, Isaac, Anastasia and Patricia. It was wonderful, balmy April evening when the Parish gathered at 8.00 p.m. in the presbytery garden for the blessing of the fire at the beginning of the Easter Vigil. During this Mass, the new Paschal Candle was blessed and lit before a procession into a dark Church. The Parish Schools and Mass Centres also had their Paschal Candles blessed. Following the singing of the Exultet and the readings from the Old Testament, the Church was illuminated during the Gloria to reveal the beauty of Our Lady of Mount Carmel. The newly installed Reredos , depicting the Annunciation, was also opened adding to the drama of the liturgy representing Christian joy in the Ressurection of our Lord. Following his homily, Fr Tony baptised, received into the Catholic Church and confirmed the members of this year's Journey in Faith Group. CLICK HERE for their testimonials. On Good Friday Father Cornelius Safe, our priest from Cameroon, celebrated the Solemn Liturgy of the Lord's Passion. In the morning the Children's Liturgy Group had the Children's Stations of the Cross, which was well attended and appreciated by children and parents alike. On Saturday 14th May, a full coach of parishioners travelled to Walsingham for the Archdiocesan Pilgrimage in honour of Our Blessed Lady. Our group was lead by Deacon Steve Dunton, who brought a few parishioners from St. Mary's, Studley. We had a very prayerful and joyful journey, as we prayed the rosary, the Divine Mercy chaplet and sang hymns to Mary. We arrived in the village of Walsingham with plenty of time for lunch and a walk around, with time to visit the Anglican Shrine. We started our procession along the Holy Mile, where some of us were fortunate enough to meet Bishop Robert Byrne, who was leading the pilgrimage this year. We arrived at the Slipper chapel and had the opportunity of passing through the Holy Door and gaining the plenary indulgence in this Year of Mercy. We then participated in Holy Mass, celebrated by His Grace and 14 other priests of the Archdiocese. The day concluded with Benediction and the Salve Regina. The weather was very kind to us this year, which added an extra blessing to the day! It was a wonderful, grace filled pilgrimage and prayed for the intentions of our parish and all our priests. The day dawned frosty on Saturday 16th January 2016 for the Establishment Day at Our Lady of Mount Carmel for the Redditch Carmelite Spirituality Group. The Carmelite Family reaches far and wide and people came from York, Manchester, as well as the Midlands and Redditch. The seed for this day was sown in January 2015 when a parishioner, Caroline Holland, completed her final profession as a Lay Carmelite in the Third Order at Saint Chad's Cathedral, Birmingham. Following from a 'Come and See' Day a series of monthly meetings were organised in the Parish Centre. Each meeting consisted of a talk, given by an invited speaker on Carmelite Spirituality, followed by Lectio Divina, evening prayer and a shared lunch. These meetings were successful enough to go-ahead with the decision to formally Establish the group. During the Mass of Establishment a letter from father Anthony Lester, O.Carm, was read out by John Berry, Delegate to the Third Order Lay Carmel of the British Province. The choir sang beautifully, especially Flos Carmeli. After the Mass the assembly convened in the Parish Centre for a luncheon reception. The Church celebrated the nativity of the Blessed Virgin Mary. She is the Mother of God, Jesus, and because Jesus makes us part of God's family she is our Mother too! The Legion of Mary held a birthday party and shared meal in the Parish Centre in the evening after a very well-attended rosary and Mass. A Gambian Catholic Choir made up of members from all over the diocese led the praise during the 11:00am Mass at the Parish Church. They sang traditional hymns for the Entrance, Offertory and Communion and also led the congregation in Latin for the Mass Parts (Orbis Factor). Afterwards they had refreshments in the Parish Centre prepared by the parishioners in thanksgiving. As the school year approaches its end the Prayer Leaders and Chaplaincy Team of Saint Bede's Middle School celebrated Mass in the School Chapel. The Prayer Leaders and Chaplaincy team provide invaluable help in providing for the spiritual needs of the whole school. They are an immense support for the Catholic Life and Ethos promoted by Saint Bede's. After Mass they made some kites and then went to the Parish Church for a picnic in the Presbytery Garden, where they were joined by Saint Augustine's High School Chaplaincy. They were able to fly their kites and also have a game of football! On Good Friday, a special Stations of the Cross for children took place in the presbytery garden. Children and their parents, along with some of the Children’s Liturgy leaders, gathered to journey with Jesus along the Way of the Cross. Fr. Craig began with an opening prayer, then the children lead all of the readings and prayers for each Station as we walked together around the garden. They had also prepared pictures of the Stations themselves, which helped them to understand the different stages along Jesus’ final journey. It was a very prayerful occasion and a meaningful way for the children to appreciate this holy day. The children had also prepared an Easter Garden, which they had been creating during their Children’s Liturgy sessions each Sunday of Lent. This was brought into church on Holy Saturday evening and, at the end of the Easter Vigil Mass, one of the children rolled the stone away to show that Jesus had risen. Alleluia! About 25 volunteers from the Parish and Parish Group helped the Saint Vincent de Paul Society make over 400 sandwiches for the Soup Kitchen for the homeless for the next two weeks in Birmingham. After the murder of 84 year old Father Jacques Hamel in Rouen in France it makes the Aid to the Church in Need Sponsored Walk that too place at the weekend all the more poignant. The walk, to raise funds for suffering Christians around the world, was well attended and started after the 8:15am mass outside the Parish Church and went round the Arrow Valley Lake and back again. The Parish celebrated their Patronal Feast - Our Lady of Mount Cartmel on 16th July. The church was decorated with beautiful follower arrangements in blue and pale yellow, to honour Our Lady whose statue was crowned with a golden crown brought back from Rome by Father Eddie Clare, the former parish priest. ​Receptions into the Carmelite Third Order took place during the Mass. The Formator, Caroline Holland was aided by Assistant Convenor, Susan Salaam, in receiving Christine Watson, Jane Yeomans and Monique Hunt. Each was clothed in the Reception Scapular, and presented with copies of the Rule of Saint Albert and the Constitutions, and a copy of the New Testament. These were the first Receptions of the Redditch Carmelite Spirituality Group since its inaugural meeting in July 2015. The group regularly meets in the Parish Centre. Our Keralan Community belong to the Syro-Malabar Catholic Church having a Syriac spiritual tradition tracing its origin to the Apostle Saint Thomas nearly 2,000 years ago. ​They celebrated their Feast day in usual colourful and beautiful style. Father Martin was the main celebrant and the Keralan Chaplain Father Sebastian invited Father Cornelius and Father David to concelebrate. ​A procession took place from the Parish Church out into the street and back to Church carrying statues of Saint Thomas, the Holy Family and the Indian Saints Alphonsa, Kuriokse and Euphrasia. The Statue of Our Lady of Mount Carmel outside the Church was also blessed. ​After Mass their the community went into the Presbytery garden for refreshments and traditional drumming. On the Second Sunday of Easter held Divine Mercy Devotions for the Kidderminster Deanery led by Deacon Peter Griffith who preached about the corporal and spiritual works of mercy, trusting in Jesus and making a pilgrimage to Harvington Hall where there is a Door of Mercy. The image of Divine Mercy was blessed at 3 O'clock and the Chaplet recited along with the Litany of Saint Faustina. Saint Stephen's Day - Guild Celebrations - Star Wars! On Boxing Day, or Saint Stephen's Day, the Guild of Altar Servers had their traditional mass and enrolment of new members. Father Tony was the main celebrant. There were six new members who had been regular servers for the last 6 months. In addition two servers who had been serving at the altar for 10 years received their silver medals. They will be moving onto university in the near future and have been a model and example for all the new servers. In September our longest serving Guild member, Paul Price, celebrated his Fiftieth Anniversary of being enrolled in the Guild at the Parish Mass Centre of Ss. Richard and Hubert at Hadzor. At the mass Paul received his gold medal and congratulations from Cardinal Archbishop Vincent Nicholas and from Downing Street and Buckingham Palace. UPDATE: The servers went to see Star Wars: the Force Awakens and also Snoopy the Peanuts movie after having a small party in the parish centre. On the way to the cinema everyone was caught in part of Storm Frank's deluge. But it did not dampen the day's fun! Laudato si' , O mi Signore! Praise to you, O Lord! - from the Canticle of Creatures by Saint Francis of Assisi and the title of the Pope's encyclical on the Care of our Common Home concerning our collective responsibility towards the environment. During the summer the marquee is put up in the presbytery grounds. This gave the opportunity for Messy Church to come and sing the praises of God in His Creation. Approximately 70 children attended and undertook many activities. Our Keralan Community, who have a Syriac Spiritual tradition going back to the time of the Apostle Saint Thomas, celebrated his Feast Day. Bishop Pauly Kannookadan of the diocese of Irinjalakuda in India came to celebrate mass with Father Sebastian according to the Syro-Malabar rite. Father Tony welcomed him with a bouquet of flowers. After mass a procession took place with drums, dancing and music. King David in the Old Testament would have been proud of the devotion and singing! After the procession Bishop Pauly had lunch in the presbytery and the Keralan community went into the presbytery gardens. In addition to Statues of Mary and Saint Thomas there were three statues of Indian Saints carried in the procession: Saint Alphonsa, Saint Kuriakosa and Saint Euphrasia. The latter Saints were canonised in October 2014. Ss. Kuriakose and Euphrasia belonged to the Order of Carmelites of Mary Immaculate. All three statues are now in the Parish Church just in time for Our Patronal Feast on July 16th. Saint Thomas, all the Saints of Kerala and Our Lady of Mount Carmel pray for us! After the Carmelite 'Come and See' meeting in Redditch the Carmelite Spirituality Group was formed and had it's inaugural meeting where Sylvia Lucas, a Third Order Carmelite from Carmel in the City in London, gave a Lay Perspective on the Carmelite Spirituality Groups. Sylvia gave testimony about her own journey in faith explaining how Carmel does not have a founder but is more of a story or narrative where individuals with their own stories become bound up with God's story and His Plan of Salvation. The day was organised by John Berry the British Provincial Delegate for the Third Order (pictured last on the right in the group picture before the Statue of Our Lady of Mount Carmel) and Caroline Holland of the Birmingham Branch of Lay Carmelites and Parishioner of Our Lady of Mount Carmel (pictured in Saint Chad's Cathedral during and after her Final Profession to the Third Order in January 2015). EVERYONE IS WELCOME - for details of further meetings CLICK HERE. The children of Year 2 from Our Lady of Mount Carmel First School visited the Parish Church as part of their RE lessons. The morning consisted of three activities in the Church followed by lunch in the Parish Centre and then playtime in the presbytery garden.